Much can be done by a tailor with a suit’s shoulders to influence its final appearance. British tailoring traditionally favours a structured shoulder with padding that creates a stronger, masculine look: imagine a pinstripe suit worn by a banker. You will also see this in French power suits and Italian tailoring from Milan and Florence. It is possible to create the illusion of broader shoulders through constructing an extended shoulder, which projects the fabric of the shoulders out a bit further than the arms through the assiduous use of padding. Another option, with light padding, is the roped shoulder of Neapolitan style, where the sleevehead (top of the sleeve) is attached to the armhole a bit higher than the shoulder, creating a ridge or "roping" detail. In Italian, the name is spalla con rollino (shoulder with a little roll). Roping can also be part of a pagoda shoulder, which is slightly concave due to some padding, which results in an elegant sweep down from the collar and back up at the arm, like the roof of a pagoda. In Italian, such a shoulder is actually termed a spalla insellata (saddle), as it curves like a saddle. This creates a very bold and unique look, which is not for everyone! 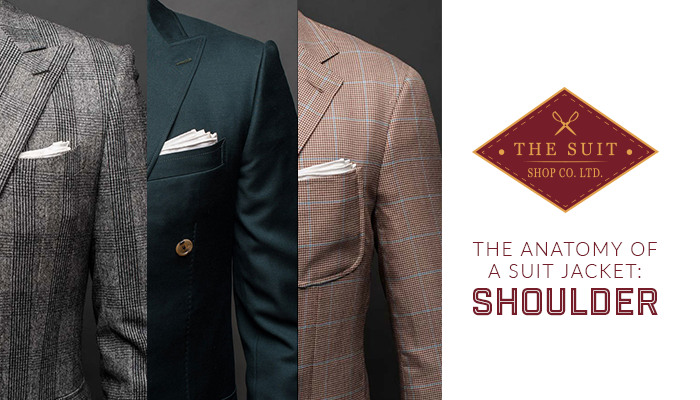 If we go without any padding, we end up with what is termed a soft shoulder or natural shoulder also most typically seen in Neapolitan tailoring. The result is a more relaxed look that Bloomberg has called "risky trend" if you work in a strict business environment but ideal to raise business casual to a new level or for weekend wear. The absence of padding creates a spalla camicia (shirt shoulder), where the arm of the suit jacket lies like a shirt sleeve, which, of course, is also unpadded.